Japanese Gastronomy: Taberu Rayu/Okinawa Chili Oil. Home-made Recipe! 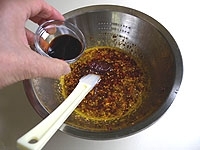 Chili oil (also called hot chili oil or hot oil) is a condiment made from vegetable oil that has been infused with dried chili peppers and sometimes also additional ingredients. It is commonly used in Chinese cuisine, East and Southeast Asia and elsewhere. Particularly popular in Sichuan cuisine, it is used as an ingredient in cooked dishes as well as a condiment. It is sometimes used as a dipping sauce for meat and dim sum. It is also employed in the Korean Chinese noodle soup dish jjamppong. 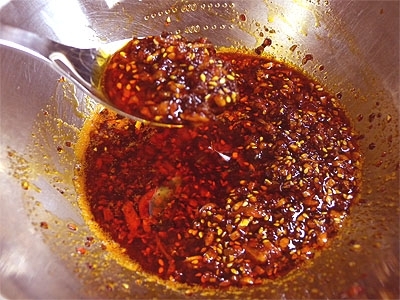 The Japanese variety of Chinese chili oil is known as rāyu (ラー油 or 辣油), used in Japan as a cooking ingredient or as a condiment. 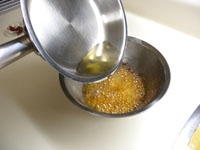 The default kind is typically a clear, chili-infused sesame oil, and the chopped chili pepper used is typically red, imparting a reddish tint to the oil. Other ingredients used may include soy oil, corn oil, dried aloe, ginger, guava leaves, leek leaves, paprika, and turmeric. Beginning in 2009, a new type of product originating from Ishigaki Island, Okinawa, known as taberu rāyu (食べるラー油 or 辣油, literally, “rāyu for eating”) became a trend in 2010. This variety is known for reduced spiciness, and in addition to the usual oil, chunks of food are included such as fried garlic and fried onion. However, the variety that includes food in the chili oil, as noted above, has existed in China since ancient times. Here is a recipe to prepare it at home! in a large bowl drop dried shrimps (chop them beforehand), chili powder, sesame oil (1 tablespoon out of the 50 ml needed) and white sesame seeds. 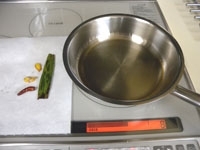 In a fry pan, pour the salad oil, the remaining sesame oil, and add the dried chili pepper, thin leek (cut) and ginger. Fry over a light fire for 2 minutes to perfume the oil. 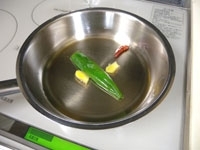 Take chili pepper, leek and ginger out before they get burned. Heat the oil over a strong fire until its starts smoking. Take off fire at once. 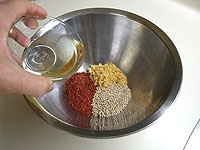 Add hot oil in two or three steps into the bowl containing mixed shrimps, chili powder, seasmes seeds and sesame oil. The whole should hiss when you add the oil! Once cooled down you can preserve it in a sealed jar for up to a month at room temperature. Note: If you cannot find dried garlic or onion cut some in slices and dry-fry them! Pingback: Inner Vision for the Weekend of November 4, 2016 - Xzan, Inc. Thank you very much for the praise and hubby’s! I’m so happy to have pleased you! The old dragon is blushing under his scales! Do notify me me when your next blog is online! 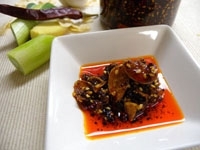 This chili sauce is dynamite with shumai! I don’t know how to thank you! You are a real magician! I have no idea how you have found it and especially so quickly! I cannot wait to prepare it. Actually I will make it today. I have all the ingredients, I only must deep-fry garlic! There is a lot of information available on the Japanese Internet!